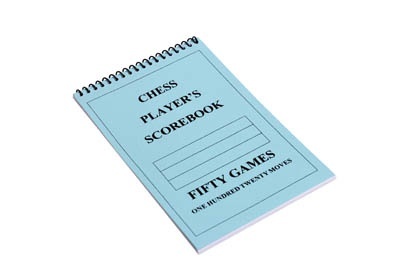 It includes a set of Championship Series Wooden Chessmen, a Folding Wooden Tournament Chessboard , The House of Staunton's best selling Deluxe Chess Tournament Bag and a Chess Player's Soft Cover Score Book. Scroll down below for complete descriptions of these items. From the House of Staunton - a full tournament-sized Chess set with a 3.75" King with a 1.5" diameter base. 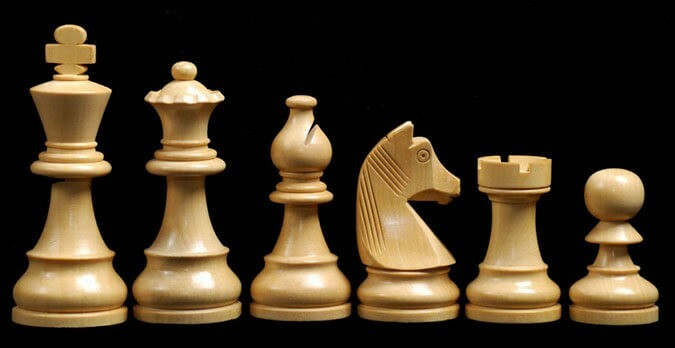 The Championship Series Wooden Chessmen are hand carved by master artisans and crafted out of the highest grade woods. The Chess pieces are heavily weighted with luxurious billiard cloth base pads and a beautiful finish. The design of the Championship Chess set is an exact reproduction of the traditional European Pattern Chessmen that have been used at every major International Chess event for the past 10 years. The prestigious list of tournaments that have used these Chessmen includes World Championships, FIDE Olympiads, Linares, Dortmund, Wijk Aan Zee and many more! From the House of Staunton - a full tournament-sized Chessboard with 2.25" Squares. Crafted in Europe, the Folding Wooden Tournament Chessboard is available in two wood combinations. You have your choice as part of this combination. 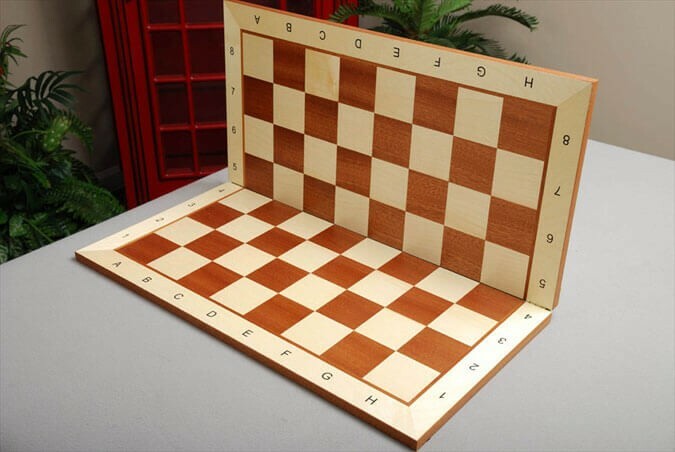 Below is the Maple & Mahogany Folding Wooden Tournament Chessboard, which features Mahogany (dark) and Maple (light) squares with a Maple frame. These veneered Chessboards are 0.5" thick, have a satin finish, and has the Rank and File Labels that make it an excellent training tool. From the House of Staunton - the most advanced tournament bag available on the market. 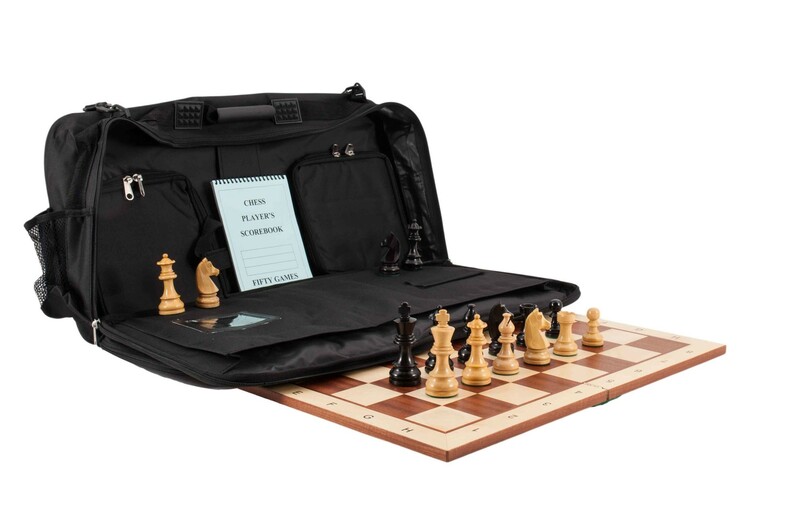 The Deluxe Chess Tournament Bag is designed to not only carry all of your tournament equipment, including roll-up chessboards, chess pieces, clock, pencils and scorebook, but can also carry a House of Staunton-brand folding wooden chessboard. 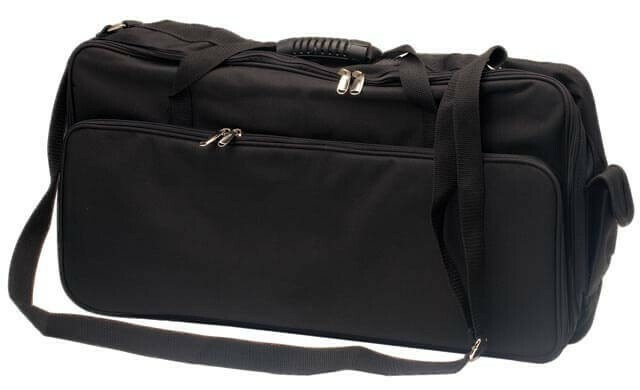 It measures 26" x 14", with a shoulder strap and reinforced nylon handles for easy transport. It also features a cell phone pocket, mesh drink pocket and large external, spacious zipper pocket. On the inside of the bag is a secured bandoleer section that consists of 34 elastic loops, allowing you to safely transport your favorite wooden chessmen. Because of its size, it can also carry chess books, multiple chess sets and other accessories.